The year is off to a solid start, according to preliminary statistics released today by Diamond Comic Distributors. 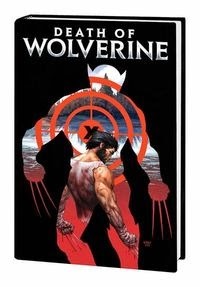 Comic shops in North America ordered nearly $44 million in comic books and graphic novels in the month, up 12.27% over last January and topping the total for December, a rare but not unprecedented feat. It is the largest dollar figure for January in the Diamond Exclusive Era, and nearly double what it was in January ten years ago. 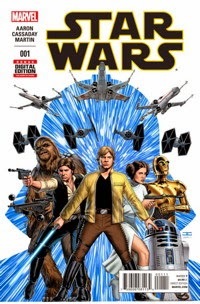 In the least surprising news in some time, Star Wars #1 from Marvel was the chart-topper: the comic book is reported by its publisher to have sales over a million copies, helped by an unprecedented number of variant covers and boosted by special editions for Loot Crate and other channels. Marvel's market share jumped as a consequence, accounting for 45.64% of units and 41.05% of dollars. Overall comics unit sales were up 10.27% year-over-year, but slightly off from December. This January was a four-ship-week month, but while January 2014 had five Wednesdays, its first Wednesday was counted as part of December 2013's shipping. So it's really a four-week-to-four-week comparison. We'll be able to provide estimates for Diamond's January sales of Star Wars #1 next week, but as always when a publisher announces a sales number for a blockbuster — and Marvel, DC, Image, and many other publishers have done so in the past — be advised that the Diamond figure will almost certainly be lower. Diamond's figure only includes the copies it shipped to North American outlets in the calendar month. There's sure to be chart activity for the title in February; there are copies going to the U.K. market; and with this particular release, there are many custom releases going outside the comics field, and it's hard to know whether they all went through Diamond. A last caveat: while January's figures surged, remember that the same things we say about poor Januaries applies here. The amount of volume in the business is lower, so swings can look large but not have much impact later in the year. Last April's volume was sufficient to erase the deficit from the winter months; likewise, a slightly off April might negate a very strong January. It's all about what's available on the shelves, and how much publishers release. Full estimates should appear here Monday.